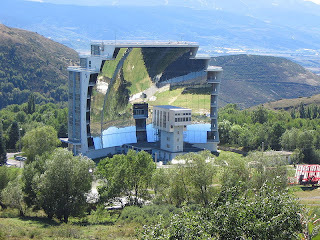 A solar furnace in France. Scientists explore the world around us and make discoveries about the universe and how it works. Engineers then apply that knowledge to solve real-world problems, usually with the goal of optimizing cost and efficiency. In other words, if science is the discovery of what is possible, then engineering takes that knowledge and makes it economical. For example, a few weeks ago I wrote about a process for making eco-friendly cement. Researchers from George Washington University developed what they called Solar Thermal Electrochemical Production (STEP), which eliminates carbon dioxide from the cement-production process. The claim was that not only would it be more eco-friendly, but also less expensive than traditional methods. STEP would use solar energy in two ways. It would eliminate the needs for fossil fuels by using solar thermal energy to melt the limestone. It would also use solar energy to electrolyze the melt to produce lime (the main ingredient in cement), oxygen and carbon monoxide. Scientifically, a very interesting idea. But let’s play devil’s advocate and take a closer look with our engineering hardhat on. Even if something can be done experimentally, it's a far cry from being profitable in the short term. One drawback of the STEP process is that it adds complexity to the production of cement, which is rarely cost-effective. The research claims that by selling the carbon monoxide by-product, they could make $300 per ton of cement produced. I view this claim with suspicion. Carbon monoxide has a small and specialized market when sold by the bottle, so if this process was implemented broadly, the demand for this by-product would drop sharply. Most carbon monoxide that is currently needed is produced on-site to avoid shipping costs. Another point to consider is whether or not the STEP process could be portable. Most cement made today is produced by trailer-mounted units that are taken to the quarry and assembled in the field. By making the cement on-site it eliminates the need to transport tons of raw materials, especially for cement where it takes about five tons of raw materials to make one ton of finished product. It's hard to envision how a vast array of solar panels and mirrors could be transported and assembled efficiently. Another potential problem with solar power is that solar panels work best in a dust-free environment. Cement production creates a lot of dust and it would be difficult to keep the solar panels clean and operating at maximum efficiency. Also, it goes without saying that this process would not work too well in colder climates. One of the truths of scientific research is that much of it never ends up as part of a real production process. That’s just the nature of the game. But even if only one idea in a hundred is successful, it’s worth the price in my opinion. And even if an idea ends up not being feasible, sometimes it will lead to another discovery. Even plastic was invented by accident in an attempt to create a cheap substitute for shellac. Such a nice post! These questions are really effective and knowledge full. Actually this type of post always useful post for Make your own quiz.